Amazon’s Transparency codes have huge potential for stopping the sale of counterfeits, but legitimate sellers are being caught in the crossfire. This post is by Travis J. Stockman, a Juris Doctor graduate and paralegal with Rosenbaum Famularo, P.C., the law firm behind AmazonSellersLawyer.com. Amazon’s Transparency codes system was recently implemented to address the problems with counterfeit products on Amazon’s platform. It helps brand owners reduce counterfeits while providing consumers with the ability to verify the authenticity of the products they purchase. While the implementation of this program is likely to improve Amazon’s anti-counterfeiting procedures, it has been causing a lot of trouble for Amazon sellers who sell authentic products. Even if a seller has no customer complaints or reported issues regarding the authenticity of their products, they may still find themselves receiving suspension notifications due to the roll-out of the new Transparency program. Where does Amazon stand on counterfeiting? It is each seller’s and supplier’s responsibility to source, sell, and fulfill only authentic products. Prohibited products include bootlegs, fakes, or pirated copies of products or content; products that have been illegally replicated, reproduced, or manufactured; and products that infringe another party’s intellectual property rights. If you sell or supply inauthentic products, we may immediately suspend or terminate your Amazon selling account (and any related accounts) and destroy any inauthentic products in our fulfillment centers at your expense. As Amazon sellers are aware, this policy is vigorously policed by Amazon. Despite the heavy regulation, counterfeit products are still appearing on the Amazon platform. How do Transparency codes help Amazon tackle counterfeit products? Amazon’s Transparency code program attempts to reduce the ongoing counterfeit problems on the platform. The program enables brand owners to identify their products with unique codes to prove the origin and authenticity of the products they sell. It allows brand owners to ensure only authentic units are shipped to customers. Fake products won’t have the unique code provided by the brand owner, so this eliminates the sale of counterfeits. In addition, Amazon customers can authenticate Transparency codes using a mobile app once the product has been received. This system was designed as a solution to provide brand owners and Amazon customers with a sense of security as to the source and authenticity of the products they purchase. How are Amazon using Transparency codes? Once a brand owner starts using Transparency codes, Amazon can perform Transparency checks at its U.S. Fulfillment Centers to ensure the authenticity of the products sold on their platform. Only Transparency-enabled products will be shipped to customers. Products without these codes will be destroyed or returned to the seller. How can Amazon customers use Transparency codes? 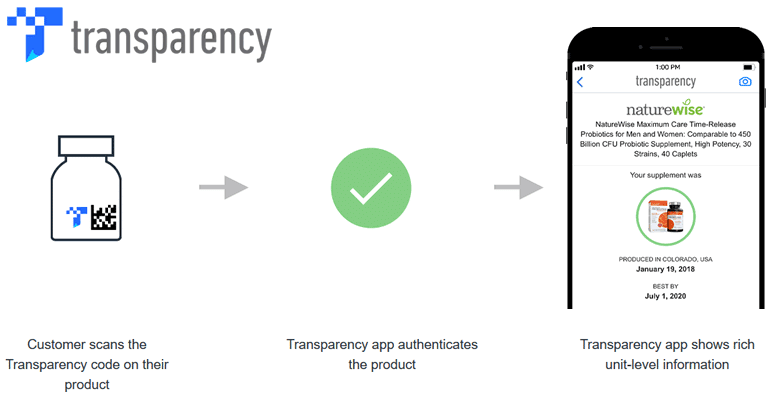 Once the product is received, the customer can scan the Transparency code and obtain verification using the Transparency mobile app. This provides Amazon customers with the ability to instantly verify the authenticity of the products they purchase. It should also eliminate any potential wrongful assertions of counterfeit products from Amazon customers. As sellers are aware, customers often claim a product is inauthentic for reasons that have nothing to do with product authenticity. The Transparency code system will inform them of the source and origin of the product they receive, and prove it is genuine. How can brand owners make use of Transparency codes? For brand owners looking to implement the Transparency code system, they will need the ability to verify themselves as the brand owner for their products, in a similar way to Amazon’s Brand Registry system. They will also need a Global Trade Item Number (GTIN) barcode on their products, such as a UPC. Finally, the brand owner will need the ability to apply the unique Transparency codes to their products. To enroll in Transparency, brand owners will need to have an invitation from Amazon to take part in the program, or can contact Amazon directly. Are Transparency codes just the same as barcodes? What happens if products are sent into FBA without Transparency codes? Many Amazon sellers offer authentic products for resale on the Amazon marketplace, in compliance with the nominative fair use and first sale doctrines. However, they may find themselves running into trouble with the new Transparency codes. …removed some of your listings because your inventory does not have valid Transparency codes, which are used to verify product authenticity. The listings we removed are at the end of this email and your FBA inventory is currently ineligible for removal. If you would like us to reinstate your listings and for your FBA inventory to be eligible for removal, please send us a plan with steps you took to resolve the issue and prevent similar concerns. Currently may not sell on Amazon.com because of concerns about the authenticity of the items listed at the end of this email. These listings are part of Amazon’s Transparency program and are now required to have a 2D barcode label on the product in order to better track inventory and ensure authenticity. Prior to receiving these notices, many sellers had been informed that a brand was going to be utilizing the new Transparency system. This told the seller that starting on a specified date, all products shipped to Amazon’s Fulfillment Centers will require the appropriate Transparency codes. Sellers were also told that authentic products sent to their facilities prior to the roll-out date would not be affected. Unfortunately, we have seen an increasing number of sellers who had products in FBA prior to the roll-out dates, but who still received notifications suspending their listing or account. What should sellers do if they are suspended for not having Transparency codes? Amazon sellers who have received these notifications should not worry just yet. Amazon is aware of the problems and sellers affected by this have been able to regain their listings and selling privileges. The notice informing them of the date that Transparency was to take effect. Documentation showing that their products were sent into FBA prior to that date. Lastly, sellers must provide invoices to verify the authenticity of the products sold. If the seller did not receive a notice about Transparency taking effect, it still helps to provide invoices and approach the plan of action the same way as an Amazon seller would for any other inauthentic complaint. For any plan, always be sure to address the root cause of the issue, the steps taken to correct the issue, and the steps taken to prevent the issue from recurring. Remember to be respectful and include as much detail as possible when sending these appeals to Amazon’s Seller Performance team. Finally, if Seller Performance fails to respond, sellers should send their plan of action to Jeff Bezos’ escalation team to try and obtain a secondary review. 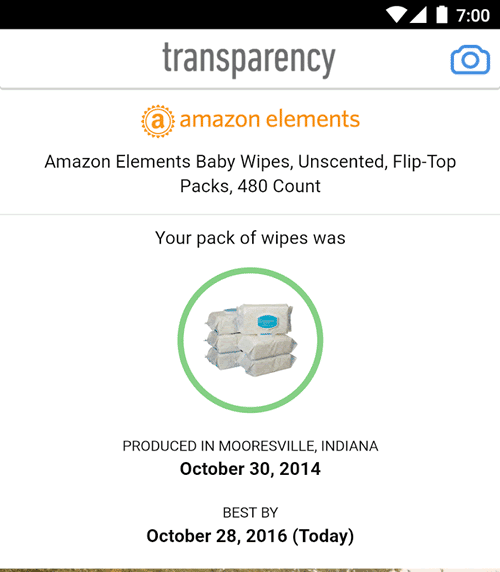 Transparency is a new system, and it still has flaws for Amazon to correct. While its potential for stopping counterfeit production is immense, the system is not perfect. As Amazon begins to implement this program, and more brand owners take part, more and more sellers are likely to run into issues. Waking up to find a performance notification indicating your account has been suspended is the last thing any Amazon seller wants. This post was by Travis J. Stockman, a paralegal with Rosenbaum Famularo, P.C., the law firm behind AmazonSellersLawyer.com. Travis has over nine years of private sector law office experience, and has helped hundreds of Amazon sellers with their suspension cases.